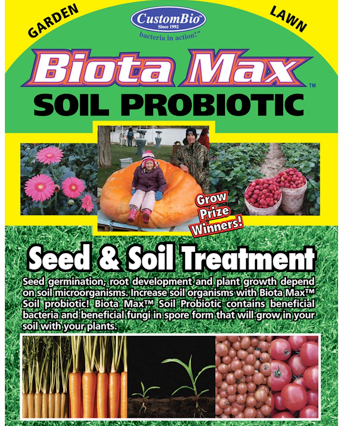 Biota Max™ is an all-natural soil probiotic. Biota Max™ contains the beneficial bacteria and beneficial fungi found in healthy, productive soil that helps you to grow bigger and better plants! Repair your soil today by replacing the natural soil biota that is lost to chemicals, heat, cold, fire, drought, and frost. The beneficial bacteria and beneficial fungi in Biota Max™ will help you grow bigger, more healthy plants using less nitrogen fertilizer. Biota Max™ contains the organisms in Custom GP™, Custom B5™ and Custom N2™. The organisms in Biota Max™ products are non-toxic, safe, and natural. NO GMO’s and NO Pathogens!!! Buy Bacteria! Buy Fungi! Buy Fungus! Buy Trichoderma harzianum, Trichoderma viride, Trichoderma koningii, Trichoderma polysporum today! Buy Bacillus subtilis, Bacillus laterosporus, Bacillus licheniformus, Bacillus megaterium, Bacillus pumilus today! This page and its contents are copyright 2009, 2010, 2011 Custom Biologicals, Inc.
Biota Max™ is an easy to use effervescent tablet containing enough bacteria and fungi spores (seeds) to treat your entire lawn and garden, up to 1/4 acre (thats 1/10 hectare). Tablets are so lightweight and easy to ship, CustomBio offers FREE SHIPPING from this web site!